(Yoon S. Byun/Globe Staff) Meg McMahon bought a bag of Old Mother Hubbard snacks for her dog, Elsa, at Pet Life in Stoneham. Hors d’oeuvres at a Hollywood Golden Globes party typically means canapés, champagne splits, maybe beluga caviar. All-natural doggie treats are not usually on the menu. But there, at the Buddha Bark Celebrity and Canine Lounge in Los Angeles, WellPet, a Tewksbury purveyor of premium pet food, served up its jerky bites and lamb treats to celebrities’ four-legged companions. The Buddha Bark event, part of WellPet’s new marketing blitz, highlights how a recession that was the bane of so many businesses has proven to be a boon for companies offering natural pet food, free from artificial preservatives, flavors, and dyes. Americans in tough times may scrimp on themselves, but not on Rover. 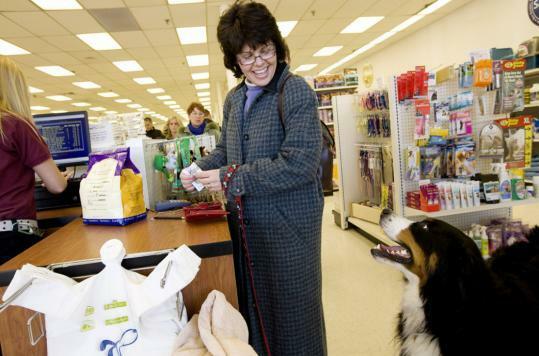 Since 2005, the natural pet food market has more than doubled, to $1.5 billion. it is projected to hit $2.6 billion by 2014, according to Packaged Facts, a market research firm. “I probably take better care of my two Irish setters than myself with regard to natural and organic products,’’ said Sheri Rohr, a wellness coach and personal trainer in Clinton who switched to WellPet’s Holistic Select line six months ago for her dogs, Brady and Rorie. She pays about $50 for a 30-pound bag of Holistic Select, about $10 more than she used to pay for a larger bag of conventional dog food. The growth in the market has attracted more established pet food businesses, such as Iams. Celebrities have also joined the fray. Talk show host Ellen DeGeneres, for example, has become an owner of Halo, Purely for Pets, which has expanded its line of natural pet products into major chains like Whole Foods and Petco. Some pet industry analysts say the dog in the house has benefited from consumers who are forced by tough times to forgo dining out, weekend trips, and expensive vacations away from home. They say people see value in paying a premium of roughly 20 percent to buy natural foods for their pet. At the same time, the outbreak of contaminated pet food that sickened and killed pets across the country in 2007 helped fuel interest in natural pet foods and prompt consumers to feed their own felines and pooches only the finest. Pam Bendock, owner of the Back Bay Veterinary Clinic, said she sees a lot of clients who are more conscious about what they feed their pets. Natural foods have helped some animals with allergies or dietary sensitivities, but Bendock said that these natural diets are relatively new and that it is hard to tell whether they will improve the quality and longevity of the lives of cats and dogs. WellPet, which has chalked up roughly 20 percent growth in sales over the past year, recently unveiled its biggest marketing campaign yet with the Golden Globes event in January, national television commercials, and print ads promoting its pet food brand, Wellness. New packaging displays information on the natural health benefits, such as in Kitten Health, which includes antioxidant rich ingredients intended to support a strong immune system. WellPet, with more than $200 million in annual sales, is known for its famous Old Mother Hubbard brand. But its Wellness pet food, launched over a decade ago, was the real groundbreaker, appealing to people who want to choose food for their pets as selectively as for themselves. Wellness offers an extensive variety of pet food, including blends for pets with allergies, antibiotic-free chicken of the same grade as required for human consumption, and natural blends that promise hip and joint relief for aging dogs. Dog trainer Robin Moxley - who runs a puppy play group at Pet Life, a pet store in Stoneham - said she recommends WellPet to her customers and uses it for her own dog because the ingredients address the immune system, skin, coat, and heart. Moxley believes that if she spends more money on natural foods now, about $10 more per bag than the conventional Iams brand she used to buy, she will spend less money at the vet later on. Other natural pet food companies are looking to capitalize on the soaring market, too. Nature’s Variety, which is known for its raw frozen pet food, is upping the ante this year with three new Instinct Kibble Varieties (one for cats, two for dogs), four new Instinct Grain-Free biscuits, and a new Bison Raw diet line, quadruple the number of products introduced in 2009. The Nebraska company has also redesigned the packaging to move the nutritional panel and ingredients from the back to the front of the bag.